Not exactly a complicated set of components and the one I want to draw your attention to most is the choice of hook. For this rig to work well without shrink tubing you will need to use a curved hook such as a Fox SSC or perhaps even the new SXC ( report still to come). 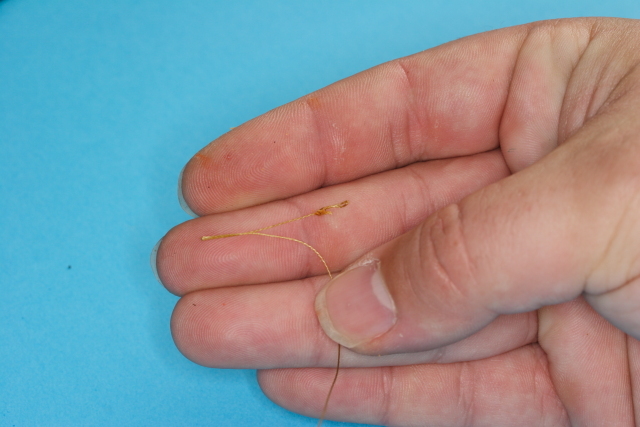 Make sure that you match the size of the rig rig to the size of the hook, too large and it will rattle around too small and the hook will not fit through. 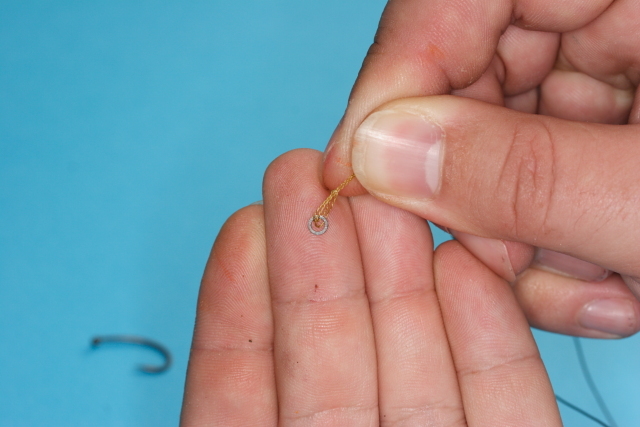 The above is a Fox 2mm rig ring which is just about perfect for a size 6 or 8,, I would drop to the smaller size of ring if I was tying this rig with a smaller hook than an 8. 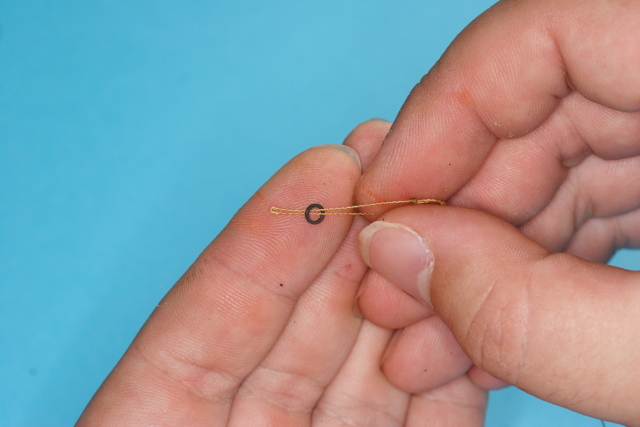 Take your chosen hook link, in this case the well proven Fox Coretex, which I use exclusively for all cases where I need a strippable braid. It meets all my requirements it is supple and can be stripped without a tool ( as in the pic above). 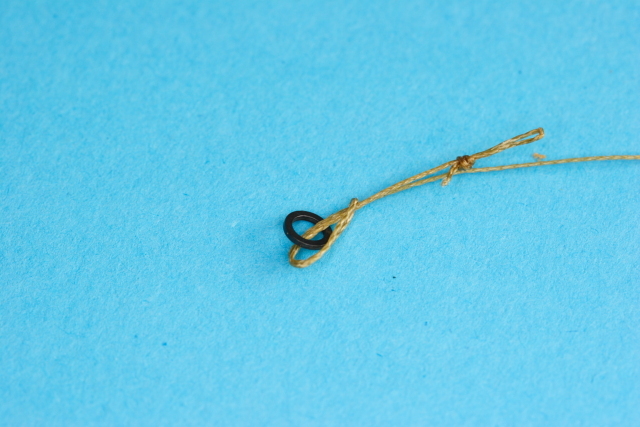 Strip about 6 inches from one end and tie a simple overhand loop as the hair loop. 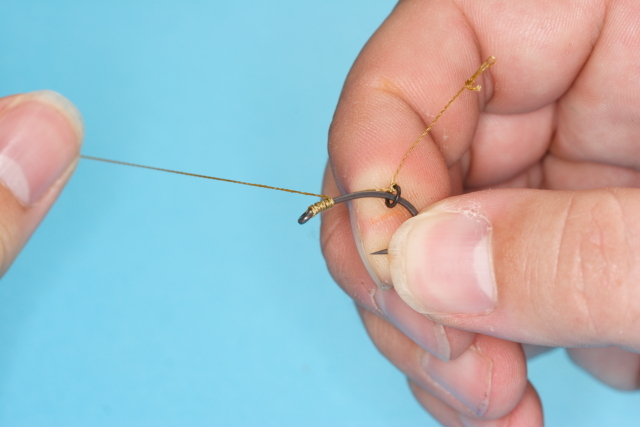 Note if you are going to use this rig for multiple baits you will want to add a braid stop before tying the loop as in the big pig line aligner. 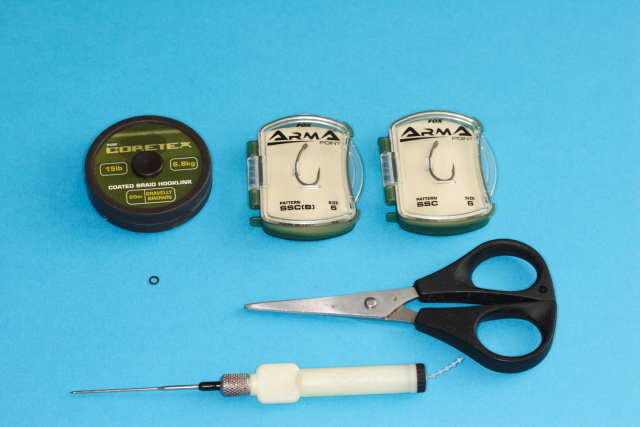 Now using your baiting needle, put on a bait of the same size that you will be using ( note you don’t need to put on a bait stop as the bait will be off in a minute) and match up where you want the ring to sit. On a Fox SSC you want the ring to be just after the 1st bend in the shank about 3/4 down. 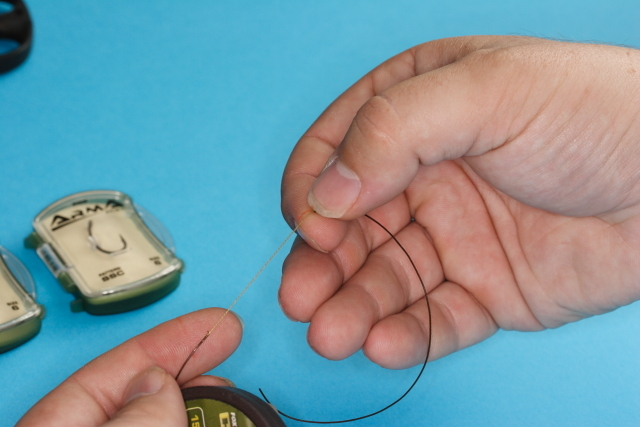 Once you have where you want to put the ring fold over the coretext and carefully remove the boilie. 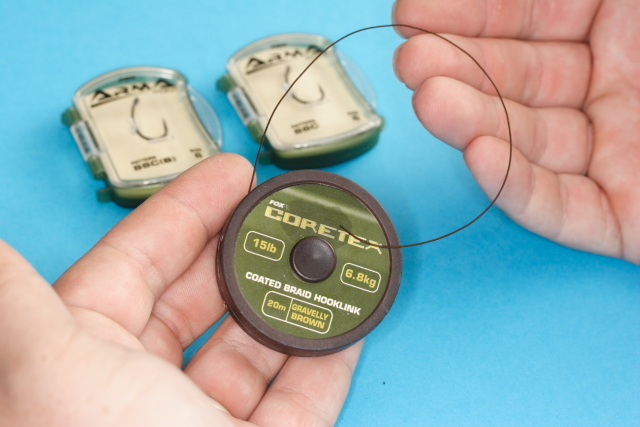 Note that once you have marked it once you can just measure the distance and if you are making rigs up in bulk ( my preferred way) you can just use the same distance from the end of the loop to the rig each time without having to waste bait or gets your hands dirty. Now the clever bit, push the folded over part of the coretex through the rig ring ( making a loop on the other side) and then thread the end of the unstripped braid and the hair loop through this new loop. 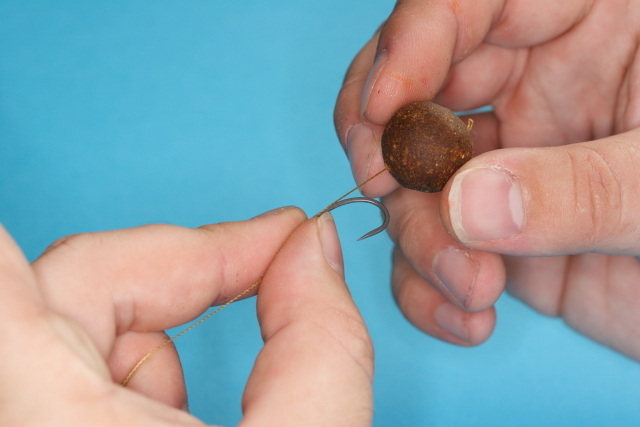 Carefully pull tight, and it should look like this. 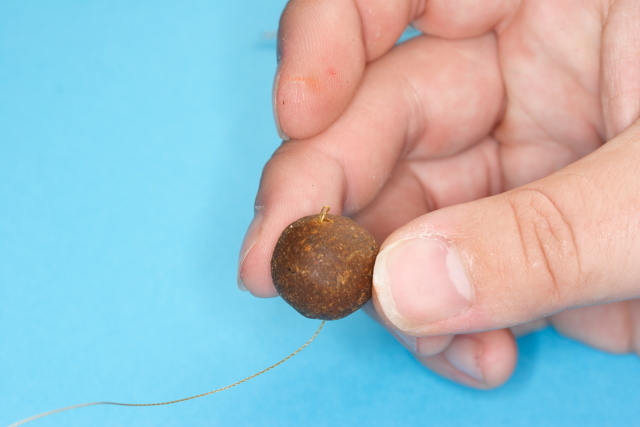 By attaching the ring in this way you stop the possibility of the ring moving down the hair as it can do if you use a series of over hand knots. 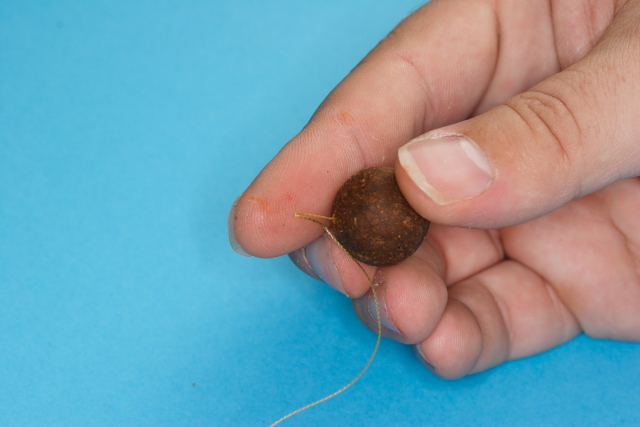 It also ensures that the bait sits straight on the rig as with over hand loops it can often sit at an angle. Now that the rig ring is attached at the correct location it is really a race to the finish and the rest of the rig is very easy. 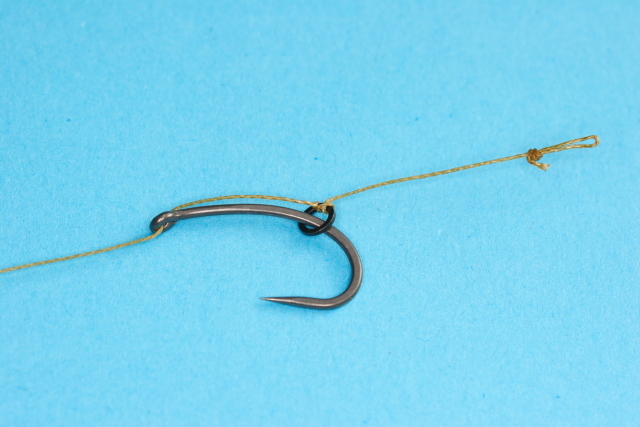 Thread the ring back on the hook and thread the coretex through the eye of the hook and position it where you want it to sit. 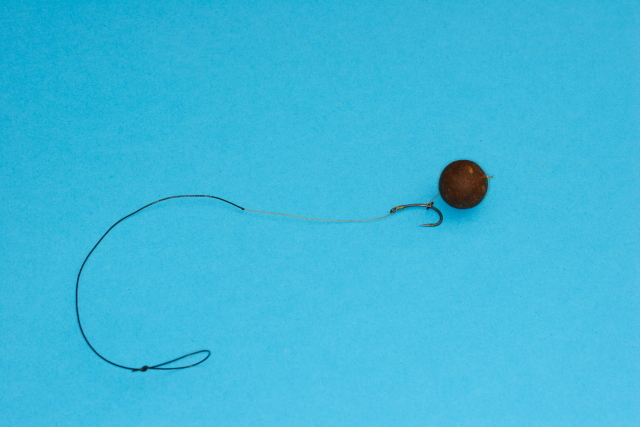 Now finish off the rig with a simple knotless knot, a simple figure of 8 loop at the other end and you are finished ! A simple effective rig, by the way I have just noticed that I forgot to put in a boilie stop in the above picture this was not deliberate just a sign I was tired 🙂 you should definitely use a boilie stop when you use it for real. What do you think ? do you tie them differently ? do you have an improvement to share ? Would you like to submit an article for publication here ? either use the contact me button above or use the comments form below and lets get in touch.